At first glance, the 1940 comedy Road to Singapore appears to be a silly movie with a thin plot, strung together with musical numbers to give it a legitimate running time. But there’s more to this film than it would seem, not the least of which is the chemistry between its two stars, Bing Crosby and Bob Hope. Crosby and Hope take refuge in Kaidoon where they rent a hut and try to live a life of leisure. No more women for them – no siree! – until they meet Dorothy Lamour, with whom they both fall in love. Two questions then dominate the remainder of the movie: (1) Which man will Lamour ultimately choose, and (2) what will be their primary source of income? Believe it or not, Road to Singapore is a significant film for a number of reasons. Firstly, it was a spoof of popular movies of the era that were set in southeast Asia. Some of these films include Red Dust, Lady of the Tropics, and The Letter. The Crosby & Hope send-up has the exotic feel of these movies with none of the seriousness. Secondly, Singapore is the first of seven road movies that Crosby and Hope made between 1940 and 1962. All of these comedies were satires of movie genres of the day, and feature running gags introduced in previous films. Thirdly, the film introduces a couple of elements that would become trademarks of the series. The first is improvisation. Crosby and Hope were clever entertainers and, while the some of their humour may seem outdated, you have to admire their nimble thinking. The series’ second trademark is known as “breaking the fourth wall” where characters address the camera directly. Hope’s characters used this most often in this series but, in the first film, it a woman who addresses the audience when she realizes Crosby has dumped her. You could say Road to Singapore is a lighthearted romp through Paramount Pictures’ Polynesian-style sets, but it’s a significant cultural marker and a testimony to a true friendship. Road to Singapore: Starring Bing Crosby, Dorothy Lamour, Bob Hope. Directed by Victor Schertzinger. Written by Don Hartman and Frank Butler. Paramount Pictures Inc., B&W, 1940, 85 mins. 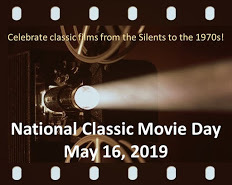 This post is part of the “Dynamic Duos in Classic Film” Blogathon, hosted by the lovely Classic Movie Hub and Once Upon a Screen. Wonderful post that has me all excited. I hadn’t realized that there was that many “Road to” movies. I think it would be great to watch them all in marathon form. Thanks again for the post and for giving me a hanker’n for these films. Yup, there were seven “Road to” films, but I would not recommend the last one, “Road to Hong Kong”. It is actually a little painful to watch. There were plans for an eighth film, but Crosby died before production started. I haven’t seen many of their films, but I absolutely love Road To Moracco! That is a really fun movie, isn’t it? I think it’s the third one they made together. Ruth, this was a fine choice for the Dynamic Duos Blogathon! I always enjoy Bob Hope and Bing Crosby whether they’re flying solo or teaming up, but their buddy chemistry in the “Road” pictures is always great fun to watch! Swell job, my friend! Thanks, Dor! Not only were their films fun to watch, their friendship is something to admire and respect. Also, they always delighted audiences with cameo appearances on each other’s shows. For instance, in the movie “The Princess and the Pirate”, Bing Crosby makes a surprise cameo at the end of the movie and steals Hope’s love interest. Hilarious! Very enjoyable piece to start off the blogathon – I like Bing Crosby but have never seen any of the Road movies, so must do so! Great stuff, Ruth. Thanks, Judy. I hope you get a chance to see a couple of the “Road to” movies. Some of the humour is a bit dated but, nonetheless, they are all-out fun. I love these movies! Your post brought back some nice memories. These are terrific, aren’t they? (Except for the last one, I have to say.) Crosby and Hope had such chemistry on screen, and it’s refreshing to see they had great esteem for each other in real life, too. The “Road” pictures are such great fun. 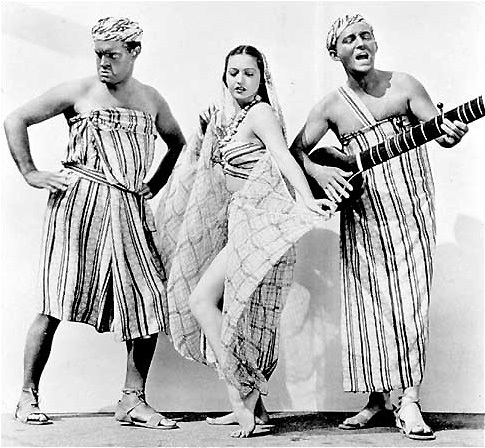 Dorothy Lamour was a great foil for the lads and I love the musical interludes. Sometimes just thinking about a gag from one of the pictures can start me giggling. Bing and Bob – a true Dynamic Duo. Great stuff. Wasn’t Dorothy Lamour a real gem? I read somewhere that she never made an enemy in Hollywood. Yippee! I love Bob & Bing. For me, they were just the greatest together. They were so natural and you could tell that they really liked and respected one another. I love the separately, but together? Just the greatest! Excellent choice & post. The respect and admiration they had for each other really is apparent, isn’t it? It’s so refreshing to hear about Hollywood friendships instead of rivalries and back-stabbing. I really enjoyed your post, Ruth (I really have to come up with some other way to tell you how much I enjoy your posts!). I have never seen a single “Road” picture — never wanted to — until now. Your sample lines actually made me chuckle, and I’m a sucker for actors talking directly to the camera. Lovely to read about Bing and Bob’s friendship, too. Off to Netflix I go . . . Thanks, Karen. I hope you have the chance to see some of these… I think “Road to Morocco” is the most famous of the series. The mildly shocking thing about that movie is the use of some hallucinogens, and I am stunned they were able to get that past the Production Code folks. Wonderful post! I’m slowly making my way through the “Road” films, and they’re so much fun! I liked how you pointed out some of the characteristics of the humor; the breaking of the fourth wall and the spoof of the current film trends is really neat to see in these movies. I have never seen any of the “Road to” movies so it looks like I have a lot to look forward to. The only Bing Crosby movie I have seen is “White Christmas” and I loved that so will have to watch these. Thanks for the recommendation! Shari, you have some wonderful movie watching ahead of you. I don’t recommend the last movie in the series, but the rest are lots o’ fun. Bing is terrific in “White Christmas”, isn’t he? In fact, I think he’s great in everything. ‘The series’ second trademark is called a “piece to camera” where characters address the camera directly.’ Interesting! I always thought it was referred to as “breaking the fourth wall”. Thanks for pointing that out, Kendra. 🙂 I realized I used the journalistic term instead of the theatrical term and, while not incorrect, I’ve made the change in my post. Awww…Bob n’ Bing! I have such fond memories of their movies as my Dad is a huge fan and as a kid when I had a weekend with him one of our things would be to get ice cream and watch one of their “Road to..” movies. The Road to Singapore was my favorite. Age 8 I wanted to be Dorothy Lamour so bad. That is a wonderful story about you and your Dad eating ice cream and watching one of these movies. What a great memory! What little girl wouldn’t want to be Dorothy Lamour? She was glamorous and kind. This is really a dynamic trio! Thanks for the information on Crosby’s and Hope’s friendship, I really admire them! Haven’t seen any of these films in quite some time. I will revisit some very soon. Always admired Hope for his great support of the US troops. If you want to see Hope and James Cagney dancing together try The Seven Little Foys. Thanks for recommending “The Seven Little Foys”, John. That is one I will have to see. I also admire Hope for his tireless support of, and travel to, U.S. troops. He was a remarkable man in many ways. There’s was a true friendship. I remember seeing clips of them on stage together with quips and one-liners flying back and forth. I’ll take one “Road” movie over a dozen of what passes today for comedy flicks which seem to be written for the average 12 year-old boy’s school lunch table. I agree with you about comedies today… Ah, I long for the days when comedies were made for grown-ups! I’m with Paul, I think I need to see these road movies in marathon form. I can see spending the day with these two. Especially knowing what I know about them now after reading your post. Imagine how many smiles that day would be filled with? These movies definitely get a little crazier as the series progresses. I think a “Road to…” Movie Marathon would be perfect for a cold and rainy day. I had no idea Singapore was the first – I just watch the road movies in any order. I love that they poke fun at Hollywood movies, and themselves for that matter. I always have a good giggle with Bob and Bing! Great post. I always enjoy Bob Hope and Bing Crosby bromance in the “Road” classic films. They always give me a smile..
Great post–I love these films, and just made it my mission to watch ALL of them within the past few months. I watched Road to Singapore first (before I knew what the order was) and it’s still my favorite of them! There was also a great screening of Road to Utopia with fellow fans at the most recent TCM Festival. Love these guys! If I had to pick a fave “Road to…” movie, I would also choose “Road to Singapore” because Charles Coburn is one of my all-time faves. Thanks for the fabulous post. It’s lovely to hear about a screen team that was just as compatible in the real world. Hope and Crosby together in these “Road” movies were favorites of mine when I was a kid. I just KNEW they spoke directly to me and that no one else saw them when they addressed the camera. That’s how special I WAS! Great post and I love that you focus on the importance of not only this film, but this pairing. I get the distinct impression far too many of us think importance should only be attributed to seriousness, which is absurd given that comedy as a genre outlasts drama for most (non cinephiles) in a historical context. Thanks so much for joining in the blogathon and I love this choice, Ruth! I laughed when you said you felt the characters spoke directly to you — I felt the same way and, in fact, I STILL feel the same way.